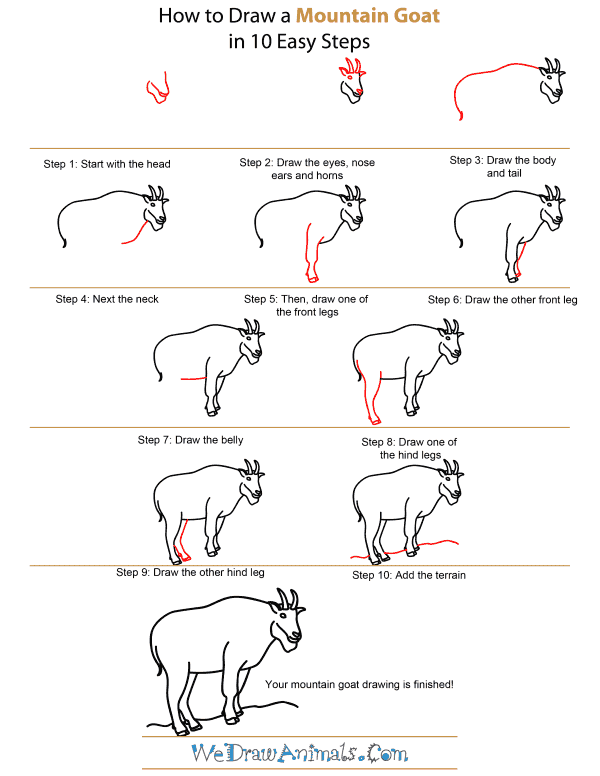 In this quick tutorial you'll learn how to draw a Mountain Goat in 10 easy steps - great for kids and novice artists. 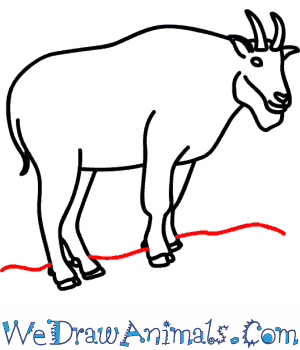 At the bottom you can read some interesting facts about the Mountain Goat. 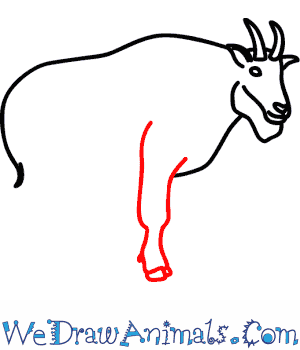 Step 1: Starting to draw your Mountain Goat may seem daunting but its just a few lines. Start with a curved line for the jaw, that turns around, and then becomes a wavey line that goes down and then up, to make the beard. Then make a line that curves, meeting the right side of your beard at about mid-way. From that curve draw an upward left slanting line that ends before it meets the jaw. Jaw. Then draw another curved line on the right side of the mouth, that curves to be completely verticle to make the front side of the head. Step 2: Next draw two lines that curve to the right and meet in a short point to make the right ear. Then add another two, longer and slightly more curved lines to make one horn. 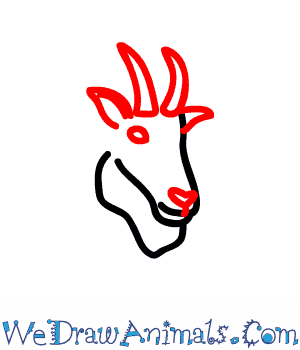 Next to that one, put in two more lines to make the next horn. The lines should meet at their ends to make the sharp tips. 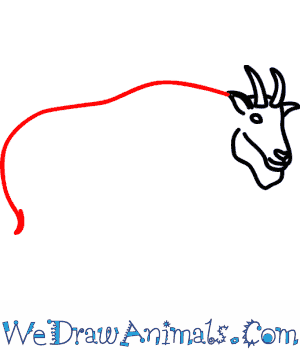 On the left side of your horns, two lines that curve towards each other to make a point to draw the left ear. 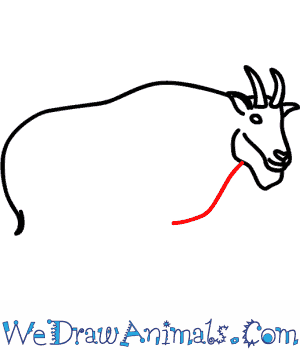 Put a circle beneath the left horn to make an eye, and put in an oval at the tip of the nose above the mouth to make the nose. Step 3: Now for the back! It will be made by a big, curving, bumpy line that goes from the tip of the left ear. It should curve up at first to imply shoulders, before curving down and then back, to curve around to make the rear hump. Step 4: To draw the chest, simply draw a slanted line that starts about halfway down the beard, and goes down and to the left. Near the bottom it should curve more to the left to create the bottom of the chest. Step 5: For the first leg and hoof, make a line that slants down and to the left that starts just behind the line at the bottom of the chest. It should then curve down, curving a bit to the right at the very bottom. Then on the left side, draw a line that curves very slightly at the top, before slanting down with a slight wobble, to imply powerful muscles in the leg. It should slant towards the front at the bottom, and draw a line just above the very bottom of the leg you've made to create the hoof. Step 6: The next leg can be drawn with one line in front of the first leg. It should curve from the chest, down and to the left, then back forward to imply obscured mass. 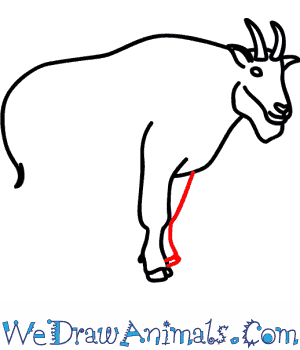 Put a line near the bottom to make the hoof. Step 7: Now draw the belly with a simple line that goes from the back of the front leg, to the left. There should be a gap left so you can add legs in the next steps! 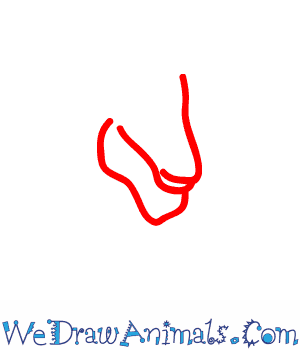 Step 8: This leg will be drawn with two curving lines that get closer as they go down. The first one will curve to the left slightly before bending to the right. The second line should start near the rear you've drawn, bending to the left at first before going more straight down, bringing this line closer to the first one you drew. 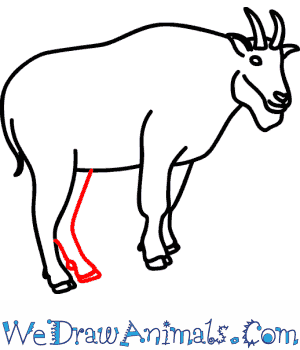 At the bottom, there should be a flat line to make the bottom of the hoof, and a line just above that to make the top of the hoof. Step 9: The last leg will be just to the right of the back leg you've drawn. It should be made of two lines. The lines should slant down and to the left at first, before turning to slant down and to the right. Near the bottom there should be a line that makes the hoof. Step 10: Add the terrain. Mountain goats are only found in North America. They inhabit the Rocky Mountains and the northwestern coastal regions of Canada and the United States, including the southwestern region of Alaska. 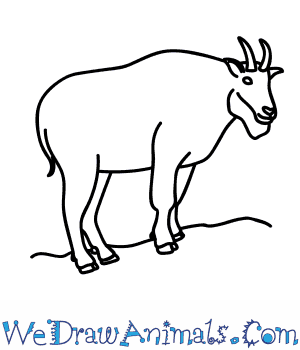 Although they are called goats, they are related to antelopes. As their name suggests, they are mountain dwellers. They are very skilled at climbing steep and rocky ledges, which their predators are too afraid to climb. This protects them from being attacked. Mountain goats have white fur, long faces, black horns, and hair on their chin that look like a beard. 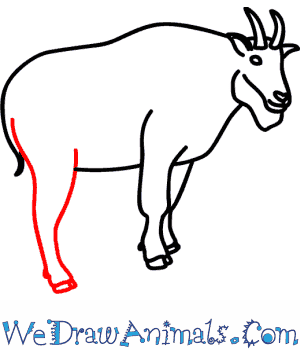 The mountain goat’s wooly white fur protects them from the cold winter weather. In the summertime they molt, which means that they shed their protective fur. There are about 100,000 living mountain goats. Mountain goats live in groups called herds. Male mountain goats typically live alone, in pairs with other males, or in groups of three male mountain goats. Females, called nannies, usually live in herds with their young and other female mountain goats. Nannies give birth to one baby at a time. Baby mountain goats are called kids. Kids weigh about six pounds when they are born. After about one day, they are able to walk.